1. From arrivals, travel 0.3km and at roundabout take the second exit (Signposted Way Out, Hotels). 2. Travel 0.6km at Airport roundabout take the first exit onto the Dublin Road- R132 (Signposted Swords). 3. At Cloghran roundabout take the second exit onto Dublin Road- R132 (Signposted Swords) 0.6km. 4. Continue forward onto Dublin Road for 1km- R132 Entering Swords. 5. At traffic signals continue forward 0.3km onto the R132. 6. At the Pinnock Hill roundabout take the second exit onto the R132 (Signposted Belfast) 0.6km. 7. At Malahide Road roundabout take the third exit onto the Malahide Road- R106 (Signposted Malahide) 0.8km. 8. At roundabout take the second exit onto the Drynam Road 0.4km. 9. At the roundabout take the first exit onto the Feltrim Road. 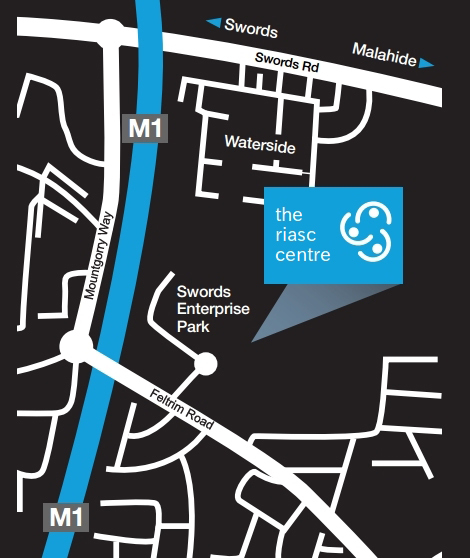 Swords Enterprise Park will then be signposted on your left. Turn left here, the Riasc Centre is now straight in front of you – the large red brick building with the green roof. 1. Travelling on the M1 Southbound take the exit toward Donabate/ Swords/ Rush and Malahide. 4. At the 3 roundabout (Malahide Road roundabout) take the first exit onto the Malahide Road. 5. After 450m take the third exit off the roundabout onto the Mountgorry Way and continue straight for 700m. 6. At the roundabout take the first left onto Feltrim Road. Swords Enterprise Park will then be signposted on your left. Turn left here, the Riasc Centre is now straight in front of you – the large red brick building with the green roof. 1. From the Dublin Port Tunnel, head Northwest on the M1 through the Port Tunnel for 13.5km. 2. At junction 4 take the exit for Donabate/ Rush/ Malahide/ Swords/ Skerries (500m). 4. At the Malahide Road roundabout, take the first exit onto the Malahide Road. 5. After 450m take the second exit off the roundabout onto the Drynam Road and continue straight for 700m. 6. At next Roundabout, take the 1st Exit. 7. At the roundabout take the first left onto Feltrim Road. Swords Enterprise Park will then be signposted on your left. Turn left here, the Riasc Centre is now straight in front of you – the large red brick building with the green roof. 1. From Eden Quay, drive for 0.4km before turning left onto Beresford Place- R105. 2. Stay on left side of road continuing with a slight turn to the right and then turn left staying on Beresford Place. 3. Continue onto Lower Gardiner Street (600m). 4. Continue onto Middle Gardiner Street (170m). 5. Continue straight onto Mountjoy Square West (160m). 6. Continue onto Upper Gardiner Street (300m). 7. Turn right at Lower Dorset Street/ N1- Continue to follow N1 (4.3km). 8. Merge onto M1 via the ramp to the M50 (5.6km). 9. At junction 4 take the exit for Donabate/ Rush/ Malahide/ Swords/ Skerries (500m). 10. At the roundabout take the first exit onto R127 heading towards Swords; go straight through the following two roundabouts (2.7km). 11. At the Malahide Road roundabout, take the first exit onto the Malahide Road. 12. After 450m take the second exit off the roundabout onto the Drynam Road and continue straight for 700m. 13. At the roundabout take the first left onto Feltrim Road. Swords Enterprise Park will then be signposted on your left. Turn left here, the Riasc Centre is now straight in front of you – the large red brick building with the green roof.